But I think there’s more to the line than that. In 1 Samuel 4, the Israelites take the Ark of the Covenant out to battle with them as some sort of talisman. They’re defeated by the Philistines, who capture the Ark and bring it back home with them. What follows is what I like to call “The Adventures of Yahweh without Israel.” The Lord humbles and defeats Dagon, the snake god of the Philistines, in his own temple, brings judgment and terror upon Philistia, and ends up plundering the lords of the Philistines before going back to his people Israel. In 1 Samuel 6, the men of Philistia send the Ark back to Israel by placing it on an oxcart and hitching two milk cows “on which there has never come a yoke” to the cart, and sending it off. Though the milk cows have calves, once they are yoked to the cart they take off straight for Israel. The Lord returns to his people in triumphal entry. He will afterward take his previous place on the throne of Israel, in the Tent of Meeting. 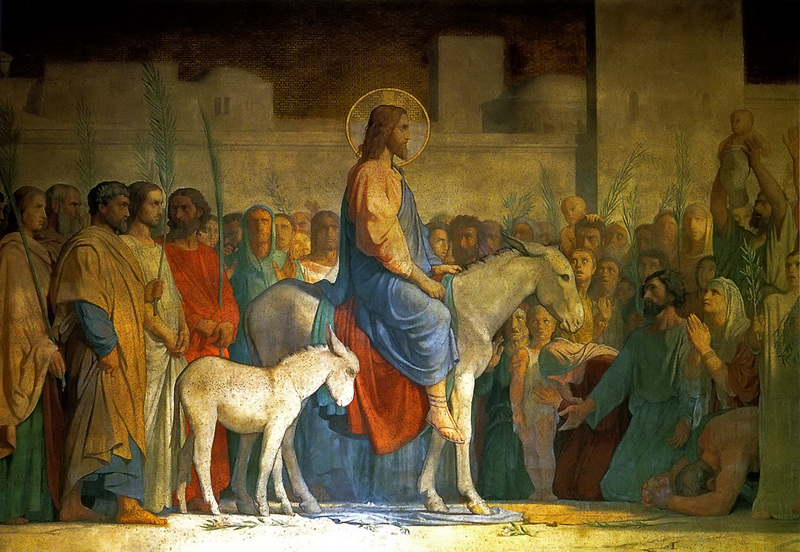 In Mark 11, Jesus is also coming to Israel in triumphal entry. He, too, is about to be enthroned. He is, in fact, the presence of Yahweh, returning to his people once again. Now, however, the order has been reversed. He has not come from his defeat of a snake god, from plundering his enemies; rather, he is riding into Jerusalem in order to take the head off the dragon, in order to plunder the grave for souls. “Sing aloud, O daughter of Zion; shout, O Israel… The King of Israel, the Lord, is in your midst; you shall never again fear evil” (Zephaniah 3:14-15).